On January 15, 2009, at approximately 3:27 PM Eastern Standard Time, US Airways flight 1549, an Airbus A320-214, N106US, equipped with CFM engines, incurred multiple bird strikes during initial climb. The airplane subsequently lost thrust to its engines and ditched in the Hudson River at approximately 3:30 PM Eastern Standard Time. The flight was a Title 14 CFR Part 121 scheduled domestic passenger flight from New York's La Guardia Airport (LGA) to Charlotte Douglas International Airport (CLT) in Charlotte, North Carolina. While on its initial climb out, the Airbus A320 struck a flock of Canada Geese which resulted in an immediate almost complete loss of thrust from both engines. When the aircrew determined that the aircraft would be unable to safely reach any airfield from its location just northeast of the George Washington Bridge, they turned it southbound and glided over the river into which they successfully ditched the airliner near the USS Intrepid Museum in midtown Manhattan about three minutes later. The captain Chesley "Sully" Sullenberger, 57, a former fighter pilot who had been an airline pilot since leaving the Air Force in 1980. He is also a safety expert and a glider pilot. The first officer was Jeffrey B. Skiles, 49, who was on his first flight in the Airbus A320 since passing the training course to fly the type. First Officer Skiles was at the controls of the flight when it took off to the northeast from Runway 4 at 3:25 p.m., and was the first to notice a formation of birds approaching the aircraft about two minutes later, while passing through an altitude of about 3,200 feet (980 m) on the initial climb out to 15,000 feet. The aircraft collided with the birds at 3:27:01. The windscreen quickly turned dark brown and several loud thuds were heard. Both engines ingested birds and immediately lost almost all thrust. Capt. Sullenberger took the controls, while Skiles began going through the three-page emergency procedures checklist in an attempt to restart the engines. At 3:27:36, using the call sign "Cactus 1539" the flight radioed air traffic controllers at New York Terminal Radar Approach Control (TRACON) "Hit birds. We lost thrust in both engines. Returning back towards LaGuardia." Passengers and cabin crew later reported hearing "very loud bangs" in both engines and seeing flaming exhaust, then silence from the engines and smelling the odor of unburned fuel in the cabin. Responding to the captain's report of a bird strike, controller Patrick Harten gave the flight a heading to return to LaGuardia and told him that he could land to the southeast on Runway 13. 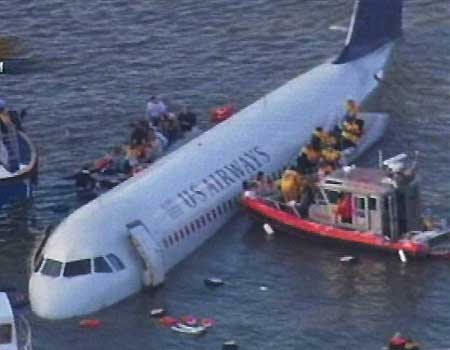 Sullenberger responded that he was unable. Sullenberger asked if they could attempt an emergency landing in New Jersey, mentioning Teterboro Airport in Bergen County as a possibility; air traffic controllers quickly contacted Teterboro and gained permission for a landing on runway 1. However, Sullenberger told controllers that "We can't do it", and that "We're gonna be in the Hudson," making clear his intention to bring the plane down on the Hudson River due to a lack of altitude. Air traffic control at LaGuardia reported seeing the aircraft pass less than 900 feet (270 m) above the George Washington Bridge. About 90 seconds before touchdown, the captain announced, "Brace for impact," and the flight attendants instructed the passengers how to do so. The plane ended its six-minute flight at 3:31 pm with an unpowered ditching while heading south at about 150 miles per hour (130 kn; 240 km/h) in the middle of the North River section of the Hudson River roughly abeam 50th Street (near the Intrepid Sea-Air-Space Museum) in Manhattan and Port Imperial in Weehawken, New Jersey. Sullenberger said in an interview on CBS television that his training prompted him to choose a ditching location near operating boats so as to maximize the chance of rescue. The location was near three boat terminals: two used by ferry operator NY Waterway on either side of the Hudson River and a third used by tour boat operator Circle Line Sightseeing Cruises.